On Wednesday, March 27, 2019, the Rackham Graduate School honored the 102nd cohort of Barbour Scholars—eight high-achieving women who come from a vast array of backgrounds and fields of study. 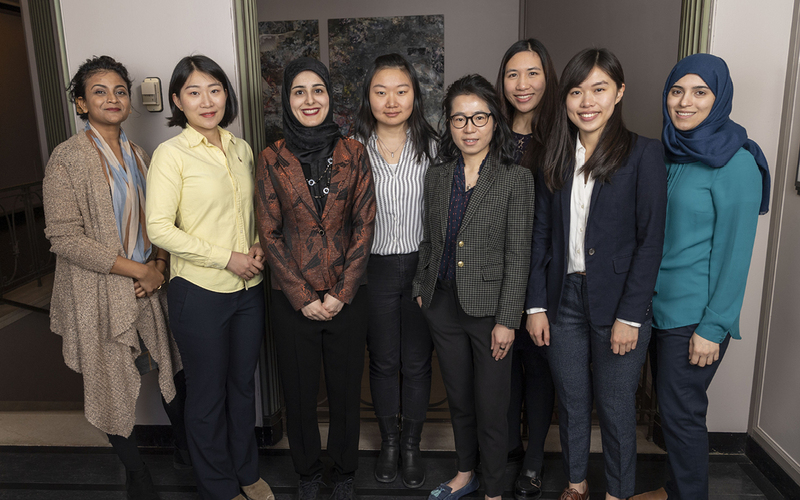 The 2019-2020 cohort includes international students from Iran, Saudi Arabia, Hong Kong, China, India, and Thailand. Joining us were a number of Barbour Scholars from years past, including three alumnae—Dr. Kathy Chu (Barbour 1978), Dr. Santha Jeyabalan (Barbour 1972), and Dr. Jiu-Hwa Upshur (Barbour 1959). This annual lunch serves as a nod to traditions born from the early days of the scholarship. Scholars, local alumnae, and faculty close to the scholarship would regularly meet for tea and social gatherings to share both academic and personal milestones. 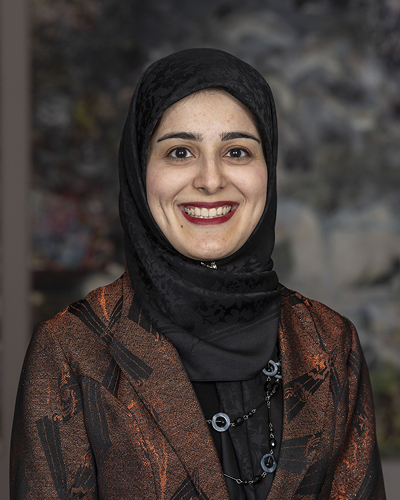 Alaa Algargoosh (Saudi Arabia) is a Ph.D. candidate in architecture. Aiming to explore the role of architectural features in enhancing the spiritual experience of mosques through sound reflections and considering that the physical measurements of architectural acoustics do not fully reflect the acoustic experience, her research adopts aural architecture. This emerging field integrates the physical, perceptual, and cultural aspects of architectural acoustics, the physical of which focusing on analyzing sound propagation in spaces, the perceptual of which dealing with the physiological effects of sound that result in emotional effect, and the cultural of which studying the role of social activities in shaping the soundscape of specific places. 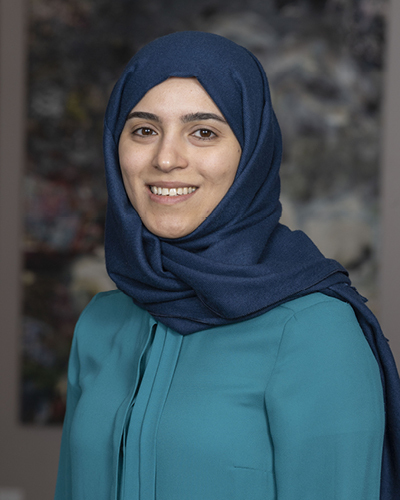 Elham Asghari Adib (Iran) is a Ph.D. candidate in cellular, molecular, and developmental biology. 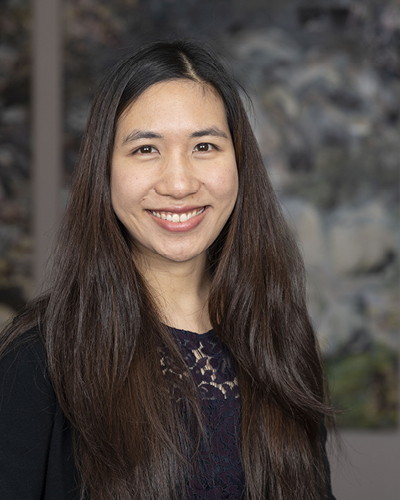 Her dissertation focuses on understanding how an evolutionarily conserved kinase, DLK, as a key mediator of the axonal stress signaling pathway, is implicated in the pathology of ALS or Alzheimer’s disease. Signaling downstream of DLK activation promotes some beneficial responses to axonal damage, including the stimulation of new axonal growth. Conversely, DLK activation can also lead to neuronal death in models of glaucoma, optic nerve injury, and ALS. Through high-throughput RNA sequencing in mouse motor neurons conditionally deleted for DLK, she expects to gain a molecular understanding of DLK’s function in axonal injury responses and whether there are commonalities in ALS models. Yingzhi Liang (China) is a Ph.D. candidate in information. She studies how mechanism design together with experimental economics can solve social problems. She considers how to use a combination of theory and experiments to examine social problems in three different contexts. First, she shows that the static mechanism used in college admissions in China is inefficient, and switching to a dynamic mechanism would result in welfare gain across China. In a second project, she investigates the optimal team size for efficient coordination. She finds that when the task requires complementary efforts from team members, a smaller team is better, whereas when the task requires substitutable efforts from team members, a larger team is better. 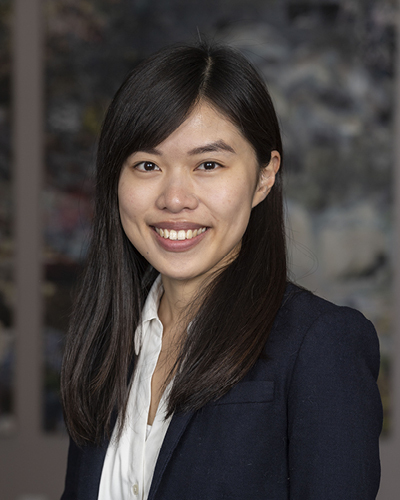 Finally, using real life data from the Chinese ride-sharing platform Didi, she investigates which factors contribute to an observed income gap between drivers. She finds that a major contributing factor to the income gap is the drivers’ home location. Naganika Sanga (India) is a Ph.D. candidate in urban and regional planning studying the role of government in influencing market developers in the production of affordable housing. Where direct legislation or mandates are the most preferred approaches by the government, they are not always feasible due to political and structural limitations. 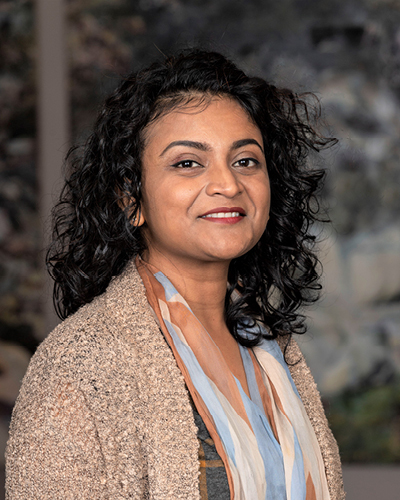 In her dissertation, Naganika adopts a comparative perspective of federal interventions in India and the United States to analyze what ‘carrots, sticks, and sermons’ are employed in different socio-economic contexts to spur privately-led affordable housing development. These alternate approaches will help create integrated and sustainable practices of affordable housing production. 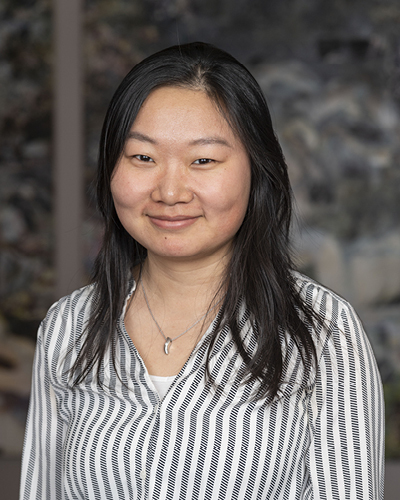 Bian Wang (China) is a Ph.D. candidate in earth and environmental sciences studying the paleoecology of extinct mammals and the effect of landscape history on mammal diversity over broad geographic regions and timescales. Her dissertation focuses on fossil ungulates (hoofed mammals) from the Intermountain West and the Great Plains through an interval of climate change approximately 16 million years ago, when ungulate diversity in North America was much higher than today. 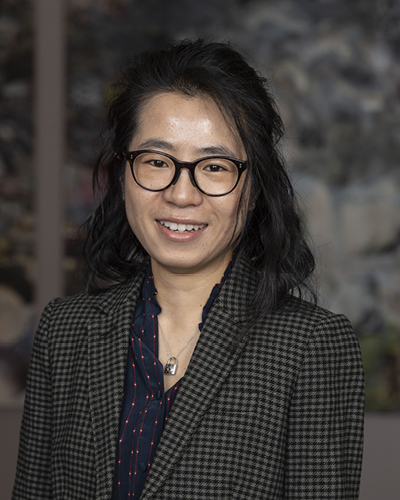 Through reconstructing the paleoecology of these plant-eating mammals, Bian investigates how species respond to changes in climate, topography, and vegetation in the history of Earth. (China) is a Ph.D. candidate in earth and environmental sciences studying the paleoecology of extinct mammals and the effect of landscape history on mammal diversity over broad geographic regions and timescales. Her dissertation focuses on fossil ungulates (hoofed mammals) from the Intermountain West and the Great Plains through an interval of climate change approximately 16 million years ago, when ungulate diversity in North America was much higher than today. Through reconstructing the paleoecology of these plant-eating mammals, Bian investigates how species respond to changes in climate, topography, and vegetation in the history of Earth. Nicole Ka-Wing Wu (Hong Kong) is a Ph.D. candidate in political science. Globalization and automation are transforming the international labor market. Native workers compete with those abroad; machines now complete a wide range of tasks that were traditionally performed by humans. Although robots replace labor, many overwhelmingly blame globalization—immigration, trade, and offshoring—but not automation for economic dislocation. When and why do people point the finger at foreigners but not robots? Her dissertation analyzes the world’s four largest economies: the United States, China, Germany, and Japan. They experienced varying degrees of backlash against globalization while undergoing automation. The first part of the project examines how individuals understand changes in the economy and assign blame. The second part addresses how attitudes toward technology and globalization affect preferences for related government policies. 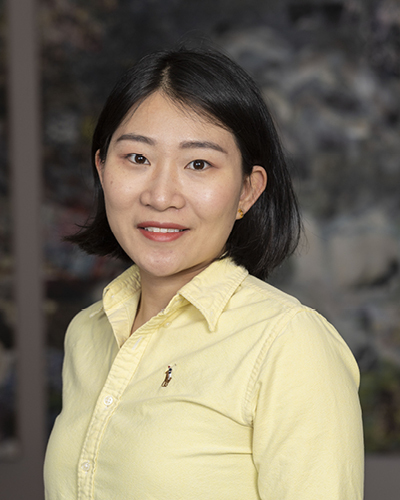 Yingying Zeng (China) is a Ph.D. candidate in macromolecular science and engineering. Organic materials with room temperature phosphorescence (ORTP) have great potentials in a variety of technologies, including organic light emitting diodes (OLEDs), sensing, and information encryption/decryption. Two key challenges in developing efficient ORTP materials are weak spin-orbit coupling and energy loss to molecular vibrations. The first part of her dissertation focuses on addressing these issues by incorporating organic phosphors into rigid metal-organic frameworks. Bright phosphorescence was achieved. This strategy has the capacity to solve the long-standing “roll-off” issue in OLEDs. The second part explores the application of ORTP nanomaterials for tumor-associated DNA detection, which will enable inexpensive, point-of-care diagnosis of cancer.